We are now officially in February! How are you doing with your New Years’ resolutions? Have you been able keep them? It seems like a lot of times people can make changes for about a month, but then we start getting back into our old habits again. I hope that you are still going strong, and you can all make the changes in your life that you are hoping to this year! Last year my husband and I worked really hard to eat better and to do more exercise. We did a pretty good job on the exercise part, but the eating better part is always the bigger challenge. It wouldn’t be hard if food (especially sweet food) didn’t taste so good! Anyway, while we did good last year, good is not enough – we want to do great this year! That is why this year, we really want to put in some extra effort to continue exercising more, but also to eat better, and that starts by making small changes and better choices. My husband always is telling me that he gets lots of cravings at work. After working hard, sometimes he really just wants something sweet to get him through the day. Usually this results in him making a trip to the vending machine (who decided to put credit card readers on those by the way??) for a not-so-healthy candy bar. One of my goals this year is to help him by coming up with some snack ideas that are better for him so that he won’t have to resort to the vending machine. 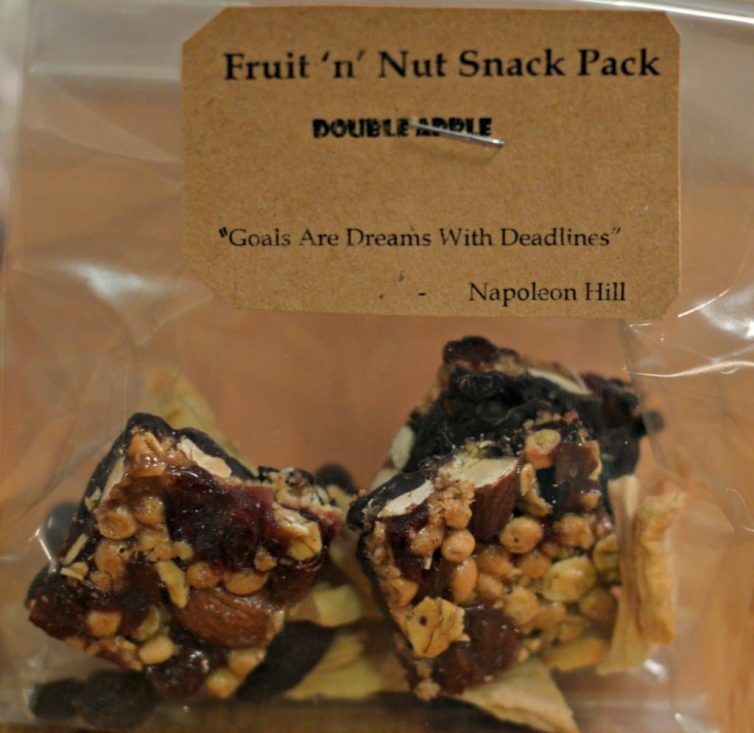 These form a great basis for these snack packs, because they contain real fruit, dark chocolate, and tasty nuts. Each pack contains 4 individual squares, which makes it easy to eat just a little bit at a time. 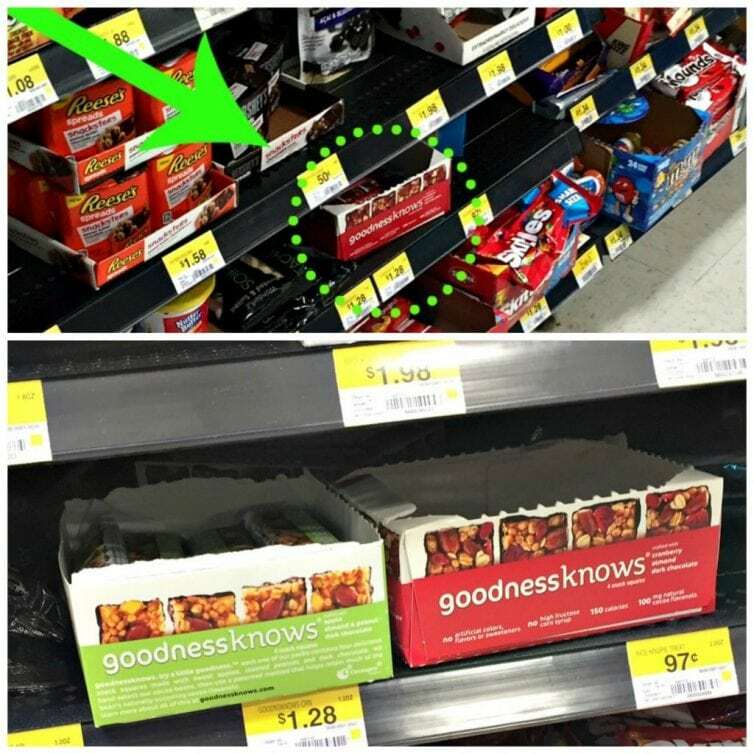 You can find them up by the register at Walmart. 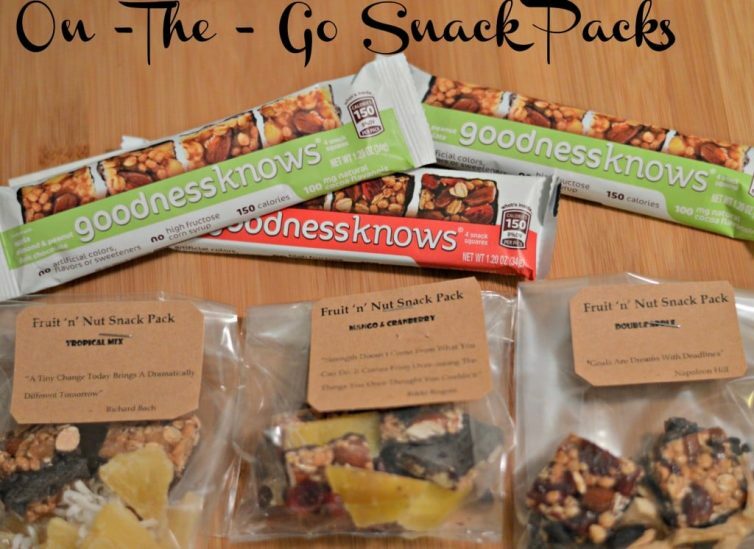 To make these on-the-go snack packs, start by unwrapping the goodnessknows® snack squares, and put them in one of these conveniently-sized plastic bags. Next, decide what other easy snack items you want to include. 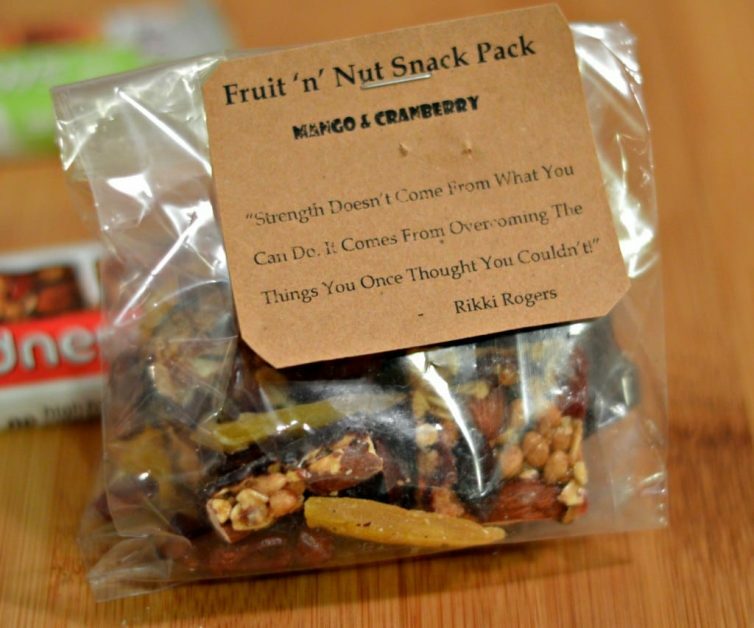 My husband and I both love dried fruit, so for these snack packs, each one features a different type of dried fruit. 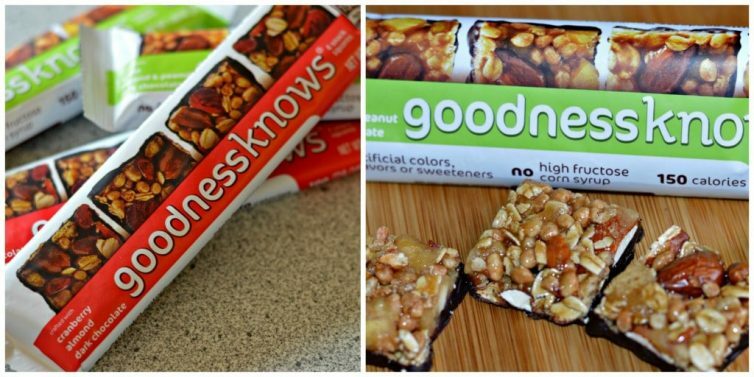 All you have to do is put in the goodnessknows® snack squares, the dried fruit, and then add a nice looking label with a motivational quote on it. Dried Mangoes cut into two or three pieces each. Dried Apples cut into two pieces each. 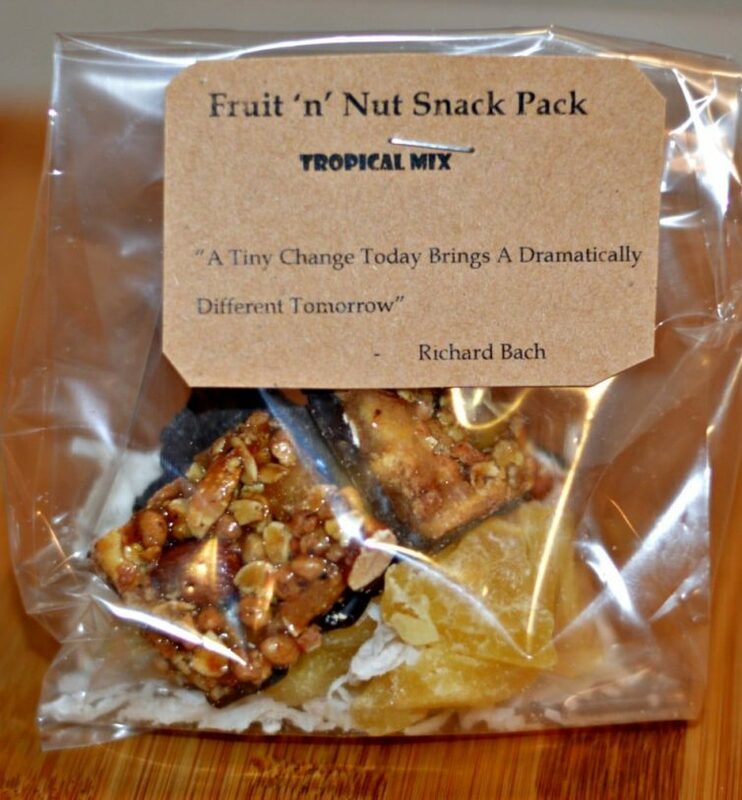 The reason that I like to add the motivational quotes is so that every time I or my husband grabs one of these snack packs out, we can be reminded of why we are trying to make better choices. Of course these are just a couple of ideas, and these can be modified to include anything that you want. I hope that this will help spark your imagination and that this will help you on your road to making better choices as well. What are some small things that you are doing to make improvements in your life this year?